CSS3 box shadows are used to create the 3D effect and transitions are used for the smooth press effect. Basic regex is used for validations and text replacements. 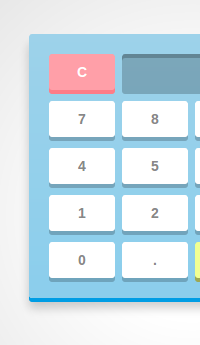 For every button(number or operator) pressed, the value is appended to an equation string displayed on the calculator screen which is later used in the JS eval function to generate the output. Awesome work, thanks for sharing! However, when downloading the calc for locally fiddling around with it, I can’t get it to work. linked up the .css and .js, but upon clicking the buttons nothing will happen. Any idea? @Carlo did you add a proper !doctype and jQuery via CDN? if the result has a decimal, the decimal btn still can work! it can’t work on chrome 25.0.1364.152 on mac os lion,but safari is ok,is there any wrong with my chrome setting? Although multiplying two negative values doesn’t seem to return a positive value. Any suggestions? But there is a bug in it . The code is not working for me. Any guidelines on d linking? @Carlo did u get the bug? Good work,Not to work ,who can explain it?? Hey, nice work! But I encountered some problems like when I click the number or any operators it will not display on the input field can you help me with this one? Amazingly written piece of art,,, thanks for showing a great example…. oh my, my jQuery example is not showing on previous comment..
Really like it, i’ll watch it until i can recite. It’s just so amazing. Really Prodigious work of Programming &amp; Art. Like plust 100% +ve Feedback to the creator(s). Rectified lots of my concepts. There’s no key on here for negative numbers. Adding the minus sign in front of a number doesn’t make it negative in this script. Is there any specific filenames or folder structures that need to be used? Everything works fine in Chrome, but the layout is breaking in Firefox 25. Is something in the css incompatible? Awesome Tuts sir..U are Great..!! How can I make this code to play in my html file? How can I insert java script code in my html document? Thanks! Great for new bies for the process of implementing. End to End front end technologies. Keep up the good work. This would also fix the bug with double decimal points after pressing “1/2=.”. Hi, when i click on a number, nothing is shown on screen? Sorry, i should add. This only occurs when i have copied the code and setup the HTML, CSS and JS on my local machine. (the website works fine) Help anyone? no is not showing in calculater!!!! pls help me gyz!. i think there is a bug..
keren, tapi setelah saya coba ke localhost nggak jalan. Lesson: don’t rely on a raw eval() function. How about -12 * -3 ? doesn’t work! Besides taking note that the jewelry you are buying is nickel free of charge, be sure to seek out the words “hypoallergenic”, “for sensitive skin” and “allergy free”.